Jordan Binnington is only the second goaltender to be named NHL rookie of the month in consecutive months since the 2006-07 season. ST. LOUIS — For the second month in a row, Blues goaltender Jordan Binnington has been named the NHL’s rookie of the month. Binnington went 6-3-0 with a 2.37 goals-against average and a .912 save percentage in March en route to becoming only the second goaltender to win the award in consecutive months since the 2006-07 season. 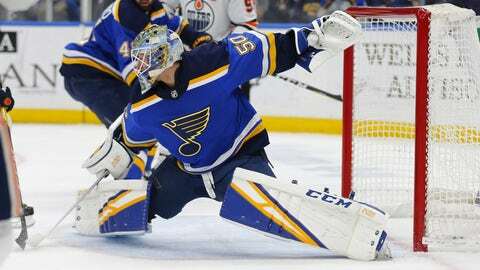 Binnington’s play since Jan. 7, when he made his first NHL start, has helped lift the Blues to second place in the Central Division and a playoff berth that seemed out of reach when the Blues had the fewest points in the league Jan. 2. The 25-year-old has gone 22-5-1 while sharing the league lead in wins and pacing all goaltenders with a 1.78 GAA (minimum 20 appearances) in that stretch. Canucks center Elias Pettersson is the only player other than Binnington to be named rookie of the month multiple times this season.